Joseph Fielding Smith, born November 13, 1838, was the first child of Hyrum and Mary Fielding Smith. When Mary Fielding married Hyrum Smith, he was the widowed father of five children. Mary willingly took responsibility for the children and, in addition to Joseph, gave birth to a daughter. Hyrum, older brother of the Prophet Joseph Smith, died on June 27, 1844. Joseph was fatherless at age six. Mary and the family arrived in Salt Lake City in 1848. In 1852, however, Mary died, leaving Joseph an orphan at age thirteen. On April 24, 1854, Joseph was ordained an elder. He also received his endowment that day, in special rooms dedicated for that purpose on the upper floor of the Council House in Salt Lake City. He was set apart for his mission by Elder Parley P Pratt, who promised him that “by the gift of God as well as by study,” he would learn the Hawaiian language. Joseph was one of twenty-one missionaries called to Hawaiʻi. They included two of his cousins, Silas Smith and Silas S Smith. Most of the group left Salt Lake City on May 27, 1854, headed for southern California. They were joined by the last member, Silas S. Smith, in Parowan. By early September, Joseph, his two cousins, and six other missionaries had raised enough money to book passage to Hawaii on a clipper ship, the Vaquero, which left San Francisco harbor September 8, 1854. The other missionaries left at various later times. They sailed into Honolulu harbor on September 27. He was assigned to work on the Islands known as Molokai and Maui. However, as he left Honolulu he became seriously ill and remained so for the first month. Mary J Hammond nursed him back to health. He was then assigned to the Kula district of Maui. A hundred days after his arrival in Honolulu he was able to conduct a meeting, open it with prayer, and give a talk in the native tongue; his fluency increased rapidly. One of Joseph’s various responsibilities was to work with the native Elders in raising money to obtain a boat for the mission. Eventually the funds collected enabled them to build a sloop out of timbers from the mountains of Oahu. Intend for use as transportation between the islands, it was named Lanai, after the island that had been designated as a gathering place for the Hawaiian Saints. It was used for a while, but it soon became clear that it was a liability rather than an asset because of the expenses involved in maintaining it. The sloop was sold in June, 1856. In July 1855, Joseph, still sixteen years old, was assigned to preside over the Church on Maui, succeeding Francis A Hammond. That same month a group of Saints arrived from Australia. They were on their way to the United States, but their ship was leaking so badly that they had to stop for repairs. When they found that it could not be repaired they had to remain in Hawaii. In April, 1856, Joseph was transferred to the big island of Hawaii, and assigned to preside over the Hilo conference. He was transferred to preside over the Kohala conference, also on Hawaii, six months later. After another six months he was assigned to preside over the Church on the island of Molokai. While serving on Molokai, Joseph again became desperately ill, this time with a fever that lasted for nearly three months. He was taken under the wing of a young Hawaiian couple, who took him into their home and did all they possibly could to help him recover. Then, a famous and tender story tells about what happened many years later when, as President of the Church, Joseph F Smith returned to Hawaiʻi. When they landed at the wharf in Honolulu, people were out in great numbers with their wreaths or Leis, beautiful flowers of every variety and hue. The Royal Hawaiian band welcomed them. The Island of Oʻahu has six Moku (districts:) Kona, Koʻolaupoko, Koʻolauloa, Waialua, Waiʻanae and ʻEwa. The Moku of Koʻolauloa extends from Kalaeokaʻoiʻo (ʻOiʻo Point) in Kualoa to Waimea Bay. Situated on the koʻolau (windward) side of the island, much of Koʻolauloa had ample rainfall, rich forests, streams, sheltered valleys, broad flat lands, reef protected shores, and rich estuarine environments to support nearshore fisheries. With its favorable climate and environment, the Lāʻie area was traditionally divided into a number of smaller sections, each with a sizeable permanent population engaged in intensive cultivation of the relatively flat, low-lying lands between the hills and the coastline. 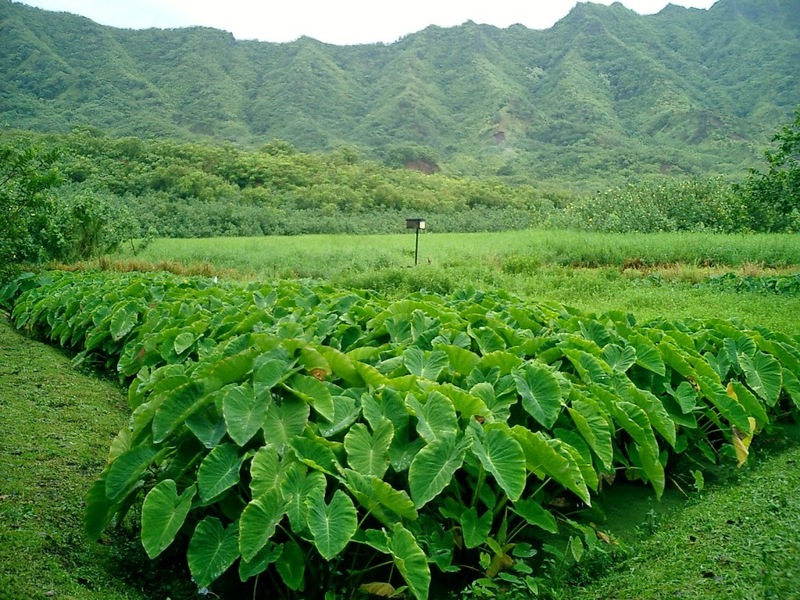 The area just mauka of the present day Mormon Temple was formerly the largest single wet taro location in the ahupuaʻa. As evidence of kalo cultivation in the area, just south of Lāʻie, towards Hauʻula, extensive systems of stone terraces for wet taro cultivation (loʻi) were widely distributed, from prehistory into historical times. After the conquest of Oʻahu in 1795 by Kamehameha I, Lāʻie was given to his half-brother, Kalaʻimamahū who eventually passed it on to his daughter, Kekāuluohi, who in turn passed it to her son with Charles Kanaʻina, Lunalilo. The entire ahupuaʻa remained under the control of Lunalilo until the Great Māhele. In March 1865, Brigham Young (President of The Church of Jesus Christ of Latter-day Saints from 1847 until his death in 1877,) in a letter to King Kamehameha V, requested permission to locate an agricultural colony in Lāʻie. The king granted his request. Mormon missionaries purchased 6,000-acres of the ahupuaʻa of Lāʻiewai to Lāʻiemaloʻo for the Mormon Church. One thousand acres were arable the remaining land was used for woodland and pasture for 500-head of cattle, 500-sheep, 200-goats and 25-horses. By 1866, 125 Hawaiian members were living on property and helping with the planting and picking of a substantial cotton crop the land was considered to have a good potential for growing sugarcane. At the time in the Islands, sugar production was growing in scale; in addition to farming for food for the mission, the Lāʻie land was considered to have a good potential for growing sugar cane. In 1867, the first sugar cane was planted; in 1868 a mule-powered mill was installed. Sugar played a central role in providing early members of the Church of Jesus Chris of Later-day Saints (Mormons) on the Lāʻie Plantation with income and financial sustainability. By 1895 the old sugar mill had stood idle almost six years. The cane was being processed by the Kahuku mill at a much cheaper price than the Lāʻie plantation could produce it. The Mormon Temple in Lāʻie – started in 1915 and dedicated on Thanksgiving Day 1919 – was the first such temple to be built outside of continental North America. The over 47,000-square-foot temple’s exterior is concrete made of crushed lava rock from the area and tooled to a white cream finish. It attracted more islanders from throughout the South Pacific. Today, the Temple, Brigham Young University – Hawaiʻi, Polynesian Cultural Center and a variety of other Mormon facilities and followers dominate the Lāʻie landscape. 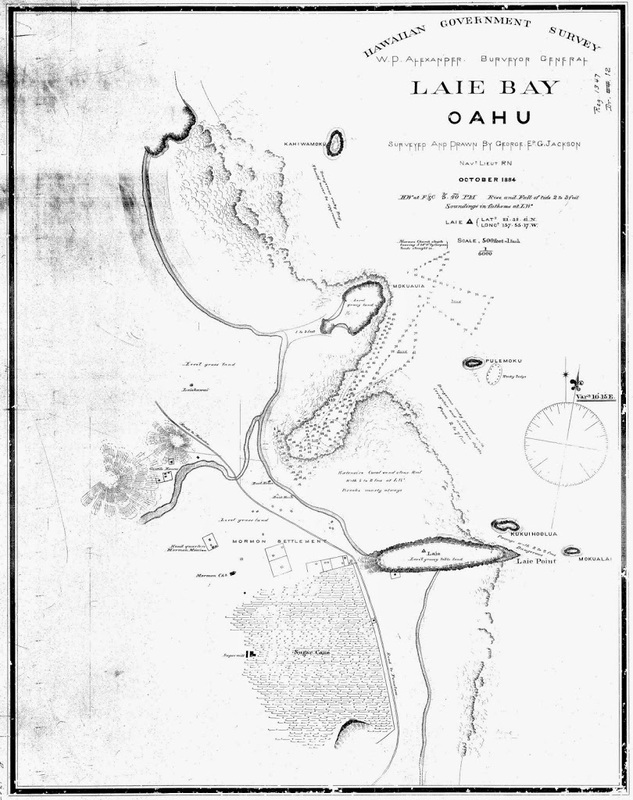 The image shows an 1884 map of Lāʻie Bay and some of the surrounding land uses (DAGS-Reg1347.) In addition, I have included other related images in a folder of like name in the Photos section on my Facebook and Google+ pages. That year, Mormon missionaries (Francis Asbury Hammond and George Nebeker) purchased about 6,000-acres of the ahupuaʻa of Lāʻiewai to Lāʻiemaloʻo (in Koʻolauloa) from Mr. Thomas T Dougherty for the Mormon Church. The missionaries hoped to create a gathering place for converts to their faith to settle in. 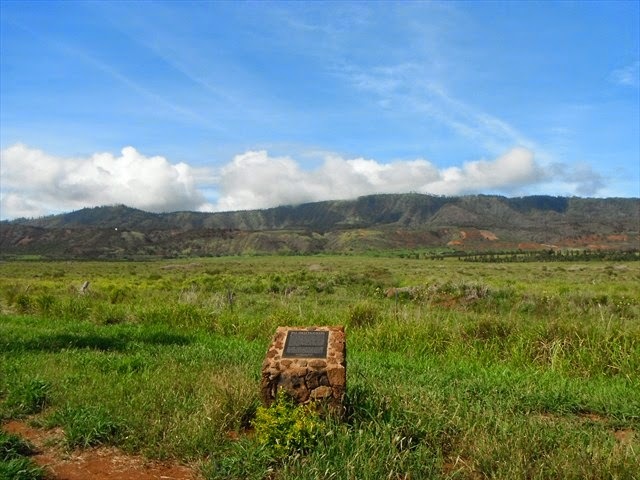 On April 5, 1882, King Kalākaua visited the village of Lāʻie as guest of honor for the ceremonial placement of four cornerstones for a new chapel being built by the Mormons. The chapel remained until 1915 when the Hawaiʻi Temple was started and the chapel was moved. Unfortunately, the historic chapel burned down during renovations on July 11, 1940. 1945 saw the end of World War II. With the end came the return of the simple island life. Hukilau (Huki = pull; lau = leaves, specifically, ki (ti) leaves) is a community fishing technique with long ropes, with dried ti leaves attached to frighten the fish. January 31, 1948, members of the Lāʻie Ward started the hukilau. (PCC) A $5 fee was charged to enjoy the hukilau, food and hula show. Two hundred and fifty people arrived for the first fundraiser and the church raised $1,250. In 1959 students and faculty at the Church College of Hawaiʻi (BYU-Hawaiʻi) organized the “Polynesian Institute” (later renamed “Polynesian Panorama”) and took the show on the road. Students performed first at the International Market Place, then put on larger performances in the Kaiser Hawaiian Dome in Waikīkī. Two years of shuttling Church College students back and forth to Waikīkī for performances convinced decision-makers that a spirited, tourist-oriented Polynesian revue with a student cast was definitely marketable. And although some argued that Lāʻie was too far from Honolulu, others insisted that the success of the hukilau demonstrated that they could draw audiences large enough to make the venture profitable. (Webb) Thus, the Polynesian Cultural Center was born. Click HERE for a link to Owen’s Hukilau Song. 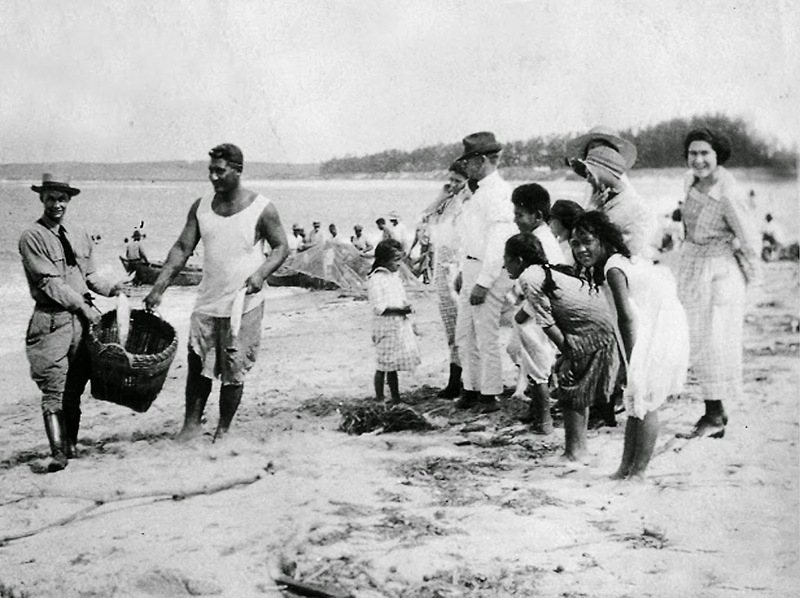 The image shows the Hukilau at Hukilau Beach, Lāʻie. In addition, I have included other related images in a folder of like name in the Photos section on my Facebook and Google+ pages.